precision, and comfort for intermediate skiers. Race Inspired, High-performance power, precision, and comfort for pro to expert skiers. The new ALIAS 100 delivers a comfortable, generous fit without sacrificing powerful, all-mountain performance. One of the lightest alpine boots on the market. A good fit for the intermediate female skiers, it won't brake the bank and you don't have to lost features. 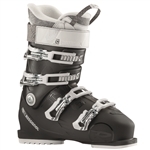 For the female skiers that have a hard time flexing most boots, this is the solution to your problem. A softer flex for a lady with a wider foot.